Seidai Software has released FairGame to allow you to strip Apple’s FairPlay DRM from your iTunes music. Apparently the software “trickery” is accomplished by enabling “Access for Assistive Devices” in the Universal Access system preferences and then turning on “Place Clip in Movie Timeline” in the iMovie HD “Import” preferences. Once set up you can select the tracks in iTunes and “process” the tracks to remove the DRM. According to the companies web site FairGame scripts the iMovie interface to process the songs and you must not interfere with the processing. 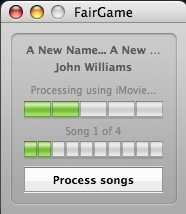 It takes about 2 mins and 42 seconds to process a 4 minute song on a 2.16GHz MacBook Pro. Now I am sure this is completely illegal in more ways than I can count, but if it works… Sweeeeet. One of the utilities that I wonder how I ever got along without is called Jumpcut by Steve Cook. My day job is working for an internet company so I live in my browser for hours and hours everyday. I am constantly copying or cutting and then pasting a piece of information from one place to another or more likely more than one piece of information. For example, before Jumpcut if I had 3 pieces of information to copy from someplace into a form I would have to do this one piece of information at a time, often switching windows or applications in between. Jumpcut lets me paste in any of the last 25 things that I cut or copied into the clipboard. Instead of doing a paste with command-V, I use control-option-V to pop up a transparent overlay that shows the current clipboard. If I hit the arrow keys while continuing to hold down the control and option keys then I can scroll through any of the last 25 clipboards. When I am done, I have pasted the information and also changed the current contents of the clipboard. Jumpcut is free. Get your copy here. 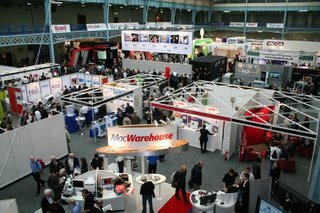 I had a busy two days at Mac Expo, leaving behind the crowds with a real good feeling that this years show was a great success. More so than previous years, because I had met so many NEW mac users. From people who had attended the show to find out more, through to those who left the show clutching their new Mac gear. One gentleman who I approached was leaving with a big smile on his face. When asked, he said, “I came here to find out about the new iMac. I had my eye on the 20 inch model”. He obviously had his questions more than answered, he continued… Now I just have to convince the wife that this 24 inch model really is only 20 inches.” So another new user, but surprisingly buying in at the top of the iMac range. Whilst taking a break for lunch, the general conversation seemed to be around the MacBook and the iPod Nano. To the extreme one nice young lady was discussing how to match the different colored Nano’s with her outfits. This made me smile, knowing that Apple had hit the nail on the head. So all in all a great show and it can only grow in size from year-to-year. I predict that this will be reflected in other shows around the world. It cannot be ignored that the Mac’s popularity is growing at quite a rapid rate. The iPod and the very cost effective MacBook may well lead new users in, but the quality of product and friendly community will be sure to keep them hooked. Until next year… enjoy your newfound knowledge and of course your new Apple purchases. In true Mac style, Griffin Technology get my ‘Best of Show’ vote at the London Mac Expo 2006. Not only because my contact there is just so pleasant, but because the company produces the most stunning products available for the iPod today. For example, take the iKaraoke. This innovative product turns your iPod into a mini Karaoke machine. The styling is good, the user interface well implemented and it is just one of those ‘must have’ products. Griffin were all smiles on day two of the Expo, because apart from my vote, they also won the ‘Mac User iPod Accessory Manufacturer of the Year’ award ! The quality of all Griffin products is superb, delivered with such enthusiasm that it shines through, from the naming to the design. Many thanks Griffin, keep up the good work, you are top of my list and iPod users from all corners of the world ! Check out the iKaraoke here. Konica Minolta had a nicely presented stand, showing a selection of their printer range. From the desktop ‘magicolor 2530DL’ through to their A3+ ‘magicolor 7450’. There were plenty of representatives from the company to ask questions. Their approach was really friendly, which was attracting visitors to the stand. The 2500 series are the desktop babies of the family. This does not mean that they skimp on features, far from it. With 5ppm in color and 20ppm in monochrome (black & white), you can print on paper up to 200gsm in weight. This is very good by desktop standards. Print quality looked top notch, with the 600dpi engine giving nice detail to the printouts. Elgato were showing their eyetv for DTT and eyetv hybrid units to the Mac public. Visitors were paying a LOT of attention to Elgato’s offerings, with stand employees reporting massive interest. The eyetv hybrid unit is a small USB stick device, which has both digital and analogue tuner. The software looks great, with some bug improvements of late. Scheduling for recording to your Mac is really easy. The years free subscription to tvtv (an online program guide) means that you can schedule recordings from anywhere you have internet access. I was impressed with the picture quality that I saw. Mac Expo: Google Video, Google Maps, SketchUp – Wow! Google made their first UK exhibition this year, with what could only be described as the ‘most colourful stand’ at the show. Throughout the three days their theatre, complete with Google colour, comfy cushions, showcased their complete product line-up. Google Maps got a brilliant reception from the crowd. My favourite Google application was SketchUp, which offers some superb 3D drawing features, with great integration with the Google online community. You can upload you creations to share with millions. The standard version of SketchUp is free, whilst SketchUp Pro 5 costs Â£315 (USD$499). It is available for Mac or PC. The Mac version is PPC, but runs pretty good under Rosetta. A universal version will be released early next year. This was a really ‘good feel’ stand and certainly was creating a lot of buzz. Mac Expo London – End of Day One: Wow, what a busy day, trying to split my interest with the big players and the smaller vendors too. My day kicked off with the Quark launch of ‘Quark Interactive Designer’ posted online earlier today. The most important note of this launch (apart from a great product) is the pricing. Grab it now whilst it is on special offer for just £69, but fear not, even the full asking price of £139 is very good. Onto the main Mac Expo show floor and things are very busy from the off. There is a lot of buzz and visitors seem genuinely enthusiastic. The one thing I picked up on very early was the number of people I heard discussing a MacBook purchase. Asking a few of them after their initial questions to Apple revealed that they were new to Apple. I must have spoken to at least twelve new users that had made their first Apple purchase at the show. 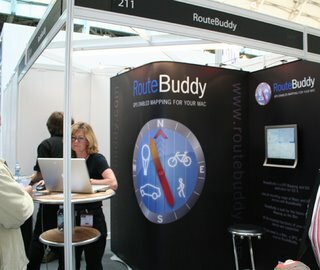 RouteBuddy, a first siting for myself, is a GPS solution for the Apple Mac. Gone are the days relying on Route 66 (which has not seen an update for many years). Routebuddy delivers one standalone app which intergrates with Garmin GPS devices (more device support to follow). Once purchased, all updates are free, with new maps available at an additional cost. Geocaching is built right into the software, with topographical data being added at a later date. Head on over to www.routebuddy.com for the full lowdown. I know Adam isn’t the biggest fan of the concept the rumored Apple iPhone. So, instead of talking about rumors, let us leave them aside for a moment and practically consider a scenario where Apple were to sell a mobile phone. The consumer expectations bar is always high for Apple. The general public looks to it as a problem solver. Apple is a leader in thinking through technical tasks and making them easy for everyone. That’s why we’re always hearing: “I wish Apple would make a …”. And when I say Apple, I think much of the credit goes to Steve Jobs, who is nothing if not a perfectionist, and we’re all beneficiaries of it.